Kirsten Hoffman led a community chat about the Friends of Cutillo Park and their efforts to improve the park at the October 2018 neighborhood meetings. Cutillo Park is located between Stillman Street and Morton Street in the North End. The park has been neglected over the past number of years, and has unfortunately seen incidents of drug use and stolen merchandise. The Friends of Cutillo Park formed earlier this year to advocate for the park and initiate improvements. Watch the video and follow along with the summary below to learn about the Friends’ goals for the park and how the community can get involved. The Friends of Cutillo Park have met with Maria Lanza from the Mayor’s Office, Parks Commissioner Chris Cook, and Councilor Lydia Edwards’ office. This summer, the Mayor’s Office created two murals in Cutillo Park to brighten the space and increase activity in the area. Kirsten also discussed the history of the park, dating back to the early 1900s. It was taken by the city in 1917 for parks purposes. It formerly stretched across Morton Street and was one of the earliest and largest open spaces in the city. 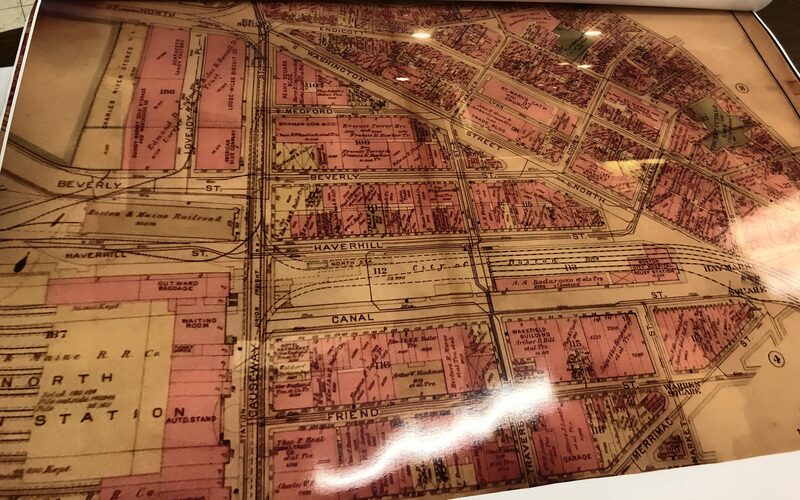 Historic map of the North End between N. Washington St. and Salem St. Cutillo Park is the large green space on the right in the photo. It used to stretch across Morton Street, the dark line running through the green area. The Friends’ short term goals include trying to keep the area cleaner and increasing activity in the area. Longer term goals include doing historic research on the park and working with the city on a long-term improvement plan. These could be complete changes to the area, perhaps creating a memorial, making Morton Street a pedestrian way with public seating, or creating a community garden. Hoffman also made a similar presentation at the North End / Waterfront Residents’ Association (NEWRA) meeting on October 11th. That video is shown below. There will be a community clean-up of the park on Saturday, November 3rd at 10 a.m. To join the Friends of Cutillo Park or learn more, visit their Facebook page and new Friends website. Wishing the Friends of Cutillo Park the best. Maybe it’s time to organize “the Friends of Foster Street Playground” or maybe the city should start giving attention to all its neglected parks and playgrounds. The Foster Street Playground has also been long neglected and the surface is collapsing under the weight of cars that now use it as a parking lot. Not sure of any other city playground that’s used for off-street parking and never cleaned. Of historical significance, much of the property was once owned by Paul Revere and was the sight of his famous bell foundry. To date we have only had lip service from the city.